Spelt flour, wholemeal khorasan flour and barley flour: three ancient cereals, rediscovered and mixed in a very special Nucleo® for baking: Le Piramidi. 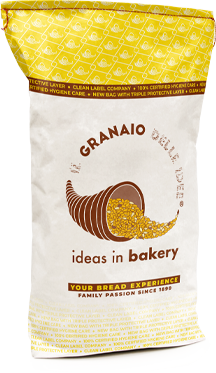 The bread produced with this mixture is ideal for a healthy and appetizing meal. Its special triangular shape makes the bread particularly crunchy. A professional patented roll is available on request.